Take a look at the influencers you follow on Instagram. If you are a mom, do you follow other moms? If you are into cooking do you follow recipe developers? Do the influencers you follow reflect who you are? Or do you follow those with totally different lives than you? Maybe you live in the midwest and you follow travel bloggers based in Dubai. Or maybe you are single and living in the south, but follow mom bloggers in NYC. No matter what your interests are, I can guarantee there are influencers out there talking about them. The interests may be broad, such as beauty or cooking, or as niche as sports betting in the Northeast. But, no matter what the topic may be chances are there is probably an influencer out there sharing about it and they have a loyal and interested following too! However, one of the greatest guilty pleasures of social media is our chance to follow the lives of those very different from us. I call these the “aspirational follows.” Aspirational follows sound harmless, but they are an important aspect for brands looking to invest in influencer marketing to keep in mind. Sure, often when you find an influencer, data will show their followers to be very similar with the same interests, similar ages, and close in location. However, what’s a little less expected but frequently true is that the audiences aren’t as similar as one would think. There’s a disconnect between influencers and their audiences – meaning an influencer’s audience doesn’t exactly mirror the influencer’s demographics and psychographics. This gap between the influencer and those who follow them, unfortunately, can mean partners may be reaching far fewer of the target audience than you hoped you would. This is something we talked about in a past blog when it came to light that people follow travel bloggers only to enjoy the beautiful imagery and daydream about world travels, not to book an immediate trip to Mykonos. 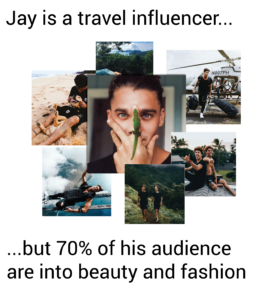 For example, take Jay Alvarrez, a hugely popular travel blogger who is sought out by many brands. He is a male, in his mid-twenties, traveling the globe, driving a G-Wagon, and jumping out of airplanes. But does his audience reflect that same lifestyle? According to our data, they don’t. In fact, travel isn’t even the number one interest of his audience. It’s fashion and beauty, which may be due to the fact that the majority of his audience are females under the age of 23. This goes for location as well. Another example would be Sarah Anderson, a Denver based family blogger. Naturally, a Denver based brand would love to work with such a big influencer local to the city, especially since it can be hard to find influencers who aren’t based in LA or NYC. But how much of her audience could even relate to a Denver based brand? Or how many could shop at a retailer specific to Denver? When you take a look at her audience location you see the top cities are New York City, Los Angeles, and Chicago. Only about 3% or 1.5k followers are in that Denver market. This disconnect isn’t always a bad thing. In fact these differences can often open up your influencer search and you can begin to leverage influencers you wouldn’t otherwise think were right for you. An example of this would be influencer Blair Flynn. She herself is a not a mother. However, over 38,000 of her followers are. If you want to reach moms, you don’t only have to look at mom bloggers. Believe it or not, they are following other people. The most important thing you can do to avoid these situations and to ensure you are reaching the right audience is to analyze audience data rather than only the influencer data. Find a platform, like Mattr, that can provide that for you. Like influencer fraud (which is a whole other monster), this disconnect is a real concern. Never assume an influencer and their audience are one in the same. If there is one thing we’ve learned in the industry, it’s that you cannot simply look to an influencer and know they are right without researching their followers too. A simple way to try and avoid these situations is to consider going micro…or even nano. Micro and nano-influencers are those with a mere 1k-5k or so followers. While this isn’t always the case, often the bigger an influencer gets, the more disconnect we see between them and their followers. As macro influencers grow, their audiences begin to show more diversity–locations broaden, as do interests and ages. When an influencer is first starting out and is still considered “micro,” their audience tends to reflect them a lot more. They start hyperlocal (which means their followers are in the same city), and typically share the same interests, age, and lifestyles. But of course there are pros and cons to using micros (read more here). No matter if you go big or go small, by analyzing audience data you’ll be able to calculate exactly how many of your target consumers you’re reaching and vastly open the pool of influencers available to pitch your brand.